This is the second part of a two-part series on the threat of new oil and gas exploitation off the coasts of the United States. The first part outlined the Trump administration’s draft proposal and answered five key questions about what the impacts of the proposed development might be. This second part examines the broad and deep political opposition to exploiting new areas of our precious coasts and makes recommendations for permanent protection. These posts are excerpted from a new Larch Occasional Paper of the same title, which fully cites sources. After exploring the potential impacts of the Trump OCS proposal, we turn to the politics of exploiting offshore oil and gas. The Trump administration faces opposition to its offshore oil and gas leasing plan from Congress and from most of the states that abut the OCS. Agencies of the federal government could also serve one way or another to keep the administration’s plans in check. 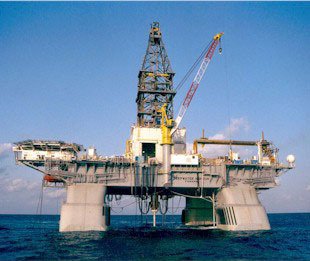 While the current executive branch of the federal government is all for offshore drilling, there are agencies in the government, especially the Department of the Interior, that have statutory obligations to protect fish, wildlife, water quality, air quality, and other resources from harm, including from fossil fuel development. If these agencies do their statutorily mandated jobs, they will serve as a drag anchor on the out-of-control ship of state. If these agencies don’t do their statutorily mandated jobs, they will be sued and then they will serve as a drag anchor on the out-of-control ship of state. 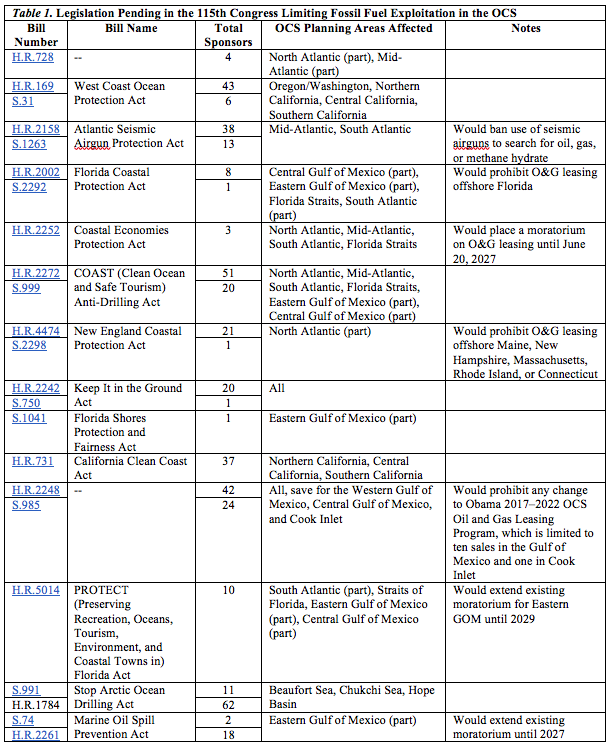 As of the date of this report, twenty-three bills pending in the current 115th Congress would limit fossil fuel exploitation in the OCS (Table 1). Even the Alaska congressional delegation doesn’t favor leasing everywhere offshore Alaska. In a letter to Secretary Zinke, the delegation supported leasing in the Chukchi, Beaufort, and Cook Inlet planning areas, as proposed in the Obama 2017–2022 OCS oil and gas leasing program. They requested that the Hope Basin, Norton Basin, St. Matthew-Hall, Navarin Basin, Aleutian Basin, Bowers Basin, Aleutian Arc, St. George Basin, Shumagin, Kodiak, and Gulf of Alaska planning areas all be dropped in the final plan of the Trump administration. Twenty-two states abut the OCS. Five states with significant existing offshore fossil fuel infrastructure generally or somewhat favor OSC drilling (TX, LA, MS, AL, and AK). 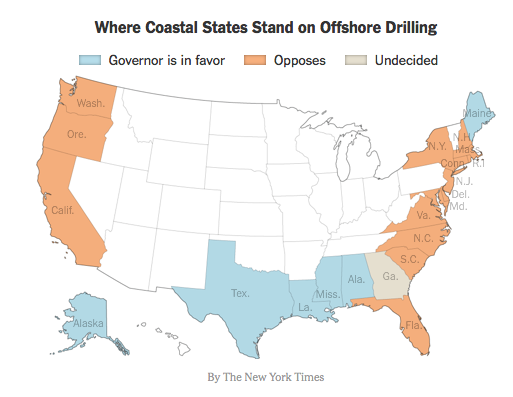 However, the governors of fifteen of the seventeen states along the Pacific and Atlantic coasts strongly oppose drilling in the OCS offshore their states (NH, MA, RI, CT, NY, NJ, MD, DE, VA, NC, SC, FL, WA, OR, and CA) (Figure 2). All have called on Secretary Zinke to exempt their states, as he did Florida. (Maine is in support of drilling and Georgia has taken no formal position. )In March 2018, 227 state legislators from seventeen coastal states signed a letter opposing the draft Trump OCS O&G plan. · refusing to permit or otherwise facilitate the development onshore of offshore energy exploitation infrastructure, including but not limited to pipelines, power lines, port facilities, and refineries. Governor Phil Murphy (D) signed a bill to block offshore drilling in New Jersey waters and to ban any infrastructure supportive of drilling in federal waters to the east. Even his predecessor, Governor Chris Christie (R), opposes OCS drilling off the Jersey shore. Similar billsare pending in several other states, including California, New York, South Carolina, and Rhode Island. The Straits of Florida Planning Area has a 95-percent probability of having 0.01 billion BOE, and a 50-percent and 95-percent probability of 0.02 billion BOE, not zero but rather close to it. At those significant digits, it’s better to call it 10 and 20 million barrels of oil respectively. The numbers make clear why it was easy for Secretary Zinke to agree to the request of Florida governor Rick Scott to take the Straits of Florida (and similarly the South Atlantic, with a 95-percent probability of zero fossil fuels) out of the leasing queue. When asked why he exempted Florida from his draft leasing plan, Zinke said on CNN, “The coastal currents are different, the layout of where the geology is.” Actually, there is not a place on Earth that doesn’t have geology. What Zinke should have said was the geology of offshore Florida is rather unpromising from the standpoint of fossil fuels. 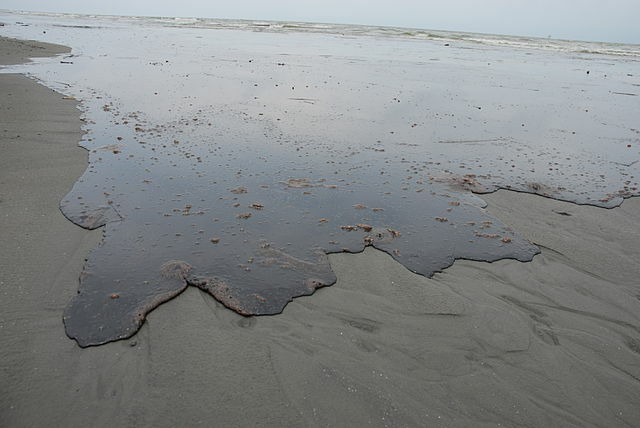 All offshore areas also have currents that can spread any oil spill long distances in short periods of time. Perhaps Zinke should have mentioned the political currents, including but not limited to a very competitive US Senate election in 2018, a likely purple state in the 2020 presidential contest, and a bipartisan congressional moratorium on leasing in the Eastern Gulf of Mexico Planning Area until June 30, 2020. Under questioning from US Senator Maria Cantwell (D-WA), Governor Kate Brown (D-OR), and US Representative Jared Huffman (D-CA), Zinke has strongly suggested he won’t be leasing offshore Washington, offshore Oregon, or much of offshore California. In the end, it’s all about the Gulf of Mexico (and parts of offshore Alaska), because that’s where the OCS O&G is. For economic, environmental, and societal reasons equally applicable to today’s and future generations, the United States should eschew any new offshore oil and gas exploitation and continue its progress toward a fossil fuel–free sustainable energy economy a decade or two earlier than it otherwise would. For the sake of the atmosphere, the biosphere, the hydrosphere, human health, and the economy, the sooner the better. No new oil and gas leasing. There should be no new leasing of any waters of the United States (or any onshore public lands, for that matter) for oil and gas exploitation. The atmosphere is already overfilled with carbon dioxide, methane, and particulate pollution from the production and combustion of oil and gas. Exploitation of the US Outer Continental Shelf’s nonrenewable fossil fuels jeopardizes the more sustainable renewable resources of the shelf that are more economically, environmentally, and socially valuable. Phaseout of existing oil and gas leasing. For the same reasons, any existing oil and gas leases should not be renewed. Permanent ocean protection. For permanent ocean protection, a variety of conservation strategies could be implemented. To permanently ban (as much as government can do so) fossil fuel exploitation, essentially all of the OCS should be designated national marine sanctuaries (see my previous Public Lands Blog post). Despite the name, the statute establishing the National Marine Sanctuaries System does not prohibit any type of use, but a management plan is developed to manage each sanctuary for multiple uses. Such management plans should favor renewable, sustainable, and nonpolluting uses over nonrenewable, unsustainable, and polluting uses but can also accommodate legitimate and necessary nonrenewable, unsustainable, and polluting activities when in the national interest. Additionally, certain areas of the US OCS are appropriate for designation as marine national monuments(see my previous Public Lands Blog post), marine national wildlife refuges, marine national parks, and other marine protected areas for the conservation and restoration of marine natural resources for this and future generations.